The second edition of Environmental Health: From Global to Local, a comprehensive introductory text, offers an overview of the methodology and paradigms of this burgeoning field, ranging from ecology to epidemiology, from toxicology to environmental psychology, and from genetics to ethics. Expert contributors discuss the major issues in contemporary environmental health: air, water, food safety, occupational health, radiation, chemical and physical hazards, vector control, and injuries. Also emphasizing a wide variety of issues of global interest, the thoroughly revised second edition contains updated information on such timely topics as toxicology, exposure assessment, climate change, population pressure, developing nations and urbanization, energy production, building and community design, solid and hazardous waste, and disaster preparedness. In addition, each chapter of Environmental Health includes learning objectives, key points, and discussion questions. "A classic textbook for the dynamic, evolving field of environmental health, thoughtful, well written, well balanced and referenced. An excellent overview of a multifaceted approach to environmental health." "With its many examples, clear explanations, and emphasis on big picture themes and relevance, it is an astonishingly interesting read." 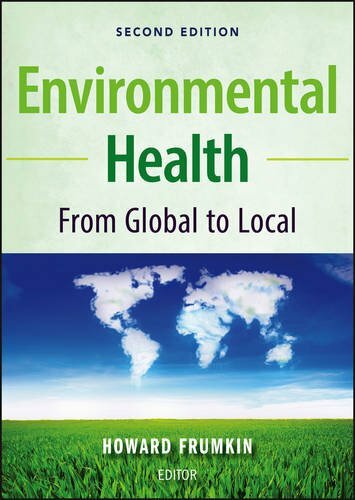 "The book's chapters contain highly pertinent insights and information on environmental issues that go beyond the usual boundaries of classic environmental health." Howard Frumkin, MD, DrPH, is director of the National Center for Environmental Health and the Agency for Toxic Substances and Disease Registry at the U.S. Centers for Disease Control and Prevention. Formerly he was professor and chair of the Department of Environmental and Occupational Health at the Rollins School of Public Health of Emory University and professor of medicine at Emory Medical School in Atlanta.